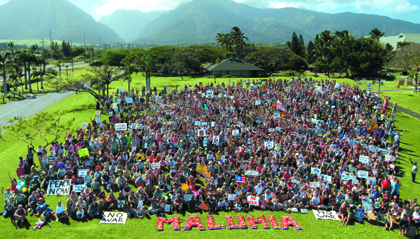 Please add your voice to our Maui Peace Action and Sacramento Physicians for Social Responsibility’s 1,000 call campaign. Call or email your representatives today. I support a diplomatic solution to North Korea’s growing nuclear threat asking and urging you to do everything within your power to prevent President Donald Trump from launching a pre-emptive military strike against North Korea, or Iran, or any other state. Please support and vote for the Restricting Use of Nuclear Weapons Act (H.R. 669/S.200) which would prohibit a U.S. President from launching nuclear weapons without a Congressional declaration of war. This will insure that no one person will have the sole authority to launch a civilization-ending nuclear war. I ask you to work to fulfill our U.S. obligation under the 1970 Nuclear Non-Proliferation Treaty by joining other countries in adopting this nuclear ban, rather than spending another $1.2 trillion on “modernizing” our nuclear arsenal. Document your actions to prevent Nuclear War. Please use the following link to report your contacts. The Threat of Nuclear War: and what we can do to prevent it. A resolution supporting peace negotiations between the US and N. Korea was unanimously adopted on Friday, March 23, by the Maui County Council and read at the March for Our Lives by Councilwoman Kelly King who introduced it. What Would Happen in a Nuclear Attack on O’ahu? 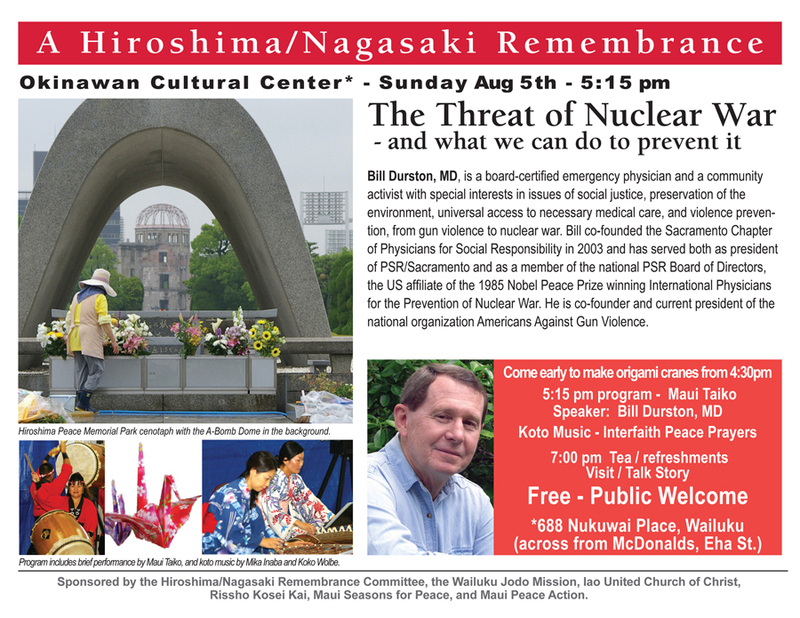 Produced by Puhipau and Joan Lander of Na Maka o ka ‘Aina in 1982 for Physicians for Social Responsibility – Hawai’i, this program explores, in stark and sobering detail, the medical and social effects of a theoretical nuclear attack on Hawai’i, particularly O’ahu. Stand Up! Speak Out! To Prevent Nuclear War! Watch the Video – Ruben Carrillo, Dir. of Photography; Dawn Kaniaupio, Producer; Dirk Fukushima, Editor. Take Action for a New DU Study – Sign the Petition at OHA website. 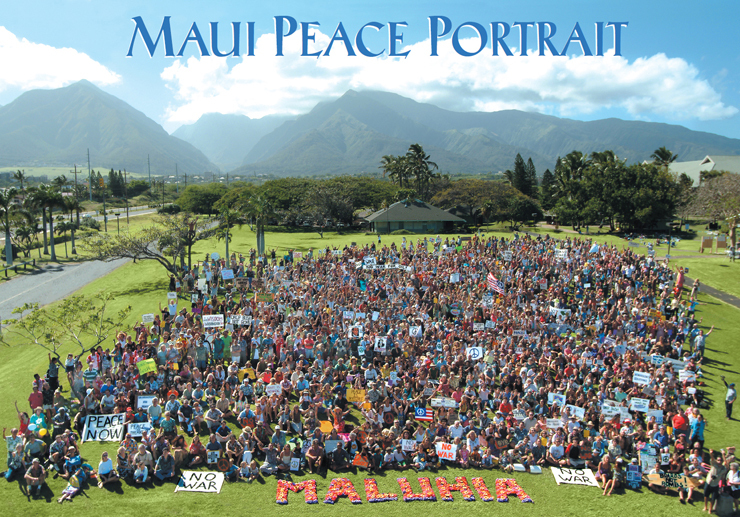 Maui Peace Action is a diverse group of citizens committed to ho’omaluhia (making peace). We encourage disarmament through peaceful international cooperation, protest preemptive aggression, promote non-violent solutions to world conflict, and educate for social justice.